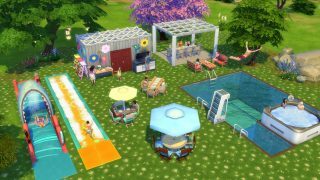 Community Spotlight: 5 The Sims 4 Backyard Stuff Lots We Love! Summer is well underway, it’s really hot outside. 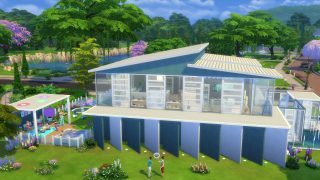 Honestly, we can’t think of a better way to deal with the heat than staying inside & letting our Sims take turns on a lawn water slide from The Sims 4 Backyard Stuff*! 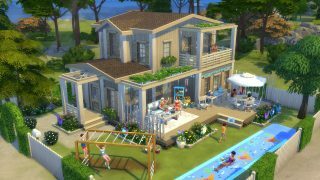 If you haven’t had a chance to build the backyard of your Sim-dreams yet, don’t worry. 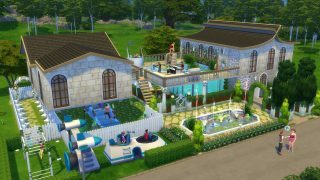 We’ve got 5 great lots you’ll love that are up on The Gallery right now, so you can have your Sim slidin’ within seconds. Yay! This lot is just gorgeous top to bottom, but that backyard is a thing of DREAMS. There are really nice areas for socialising, dining and playing, & it all fits together really well. We love the use of the plants for the roof, too! You can find this lot on the Gallery here! Never underestimate how great a small intimate backyard can be! This one would definitely be a great place for the family to relax in the evenings, catch up and talk about their day, either around the table or in the hot tub. You really can’t go wrong with that! There’s a whole bunch going on with this yard, but it’s all really awesome. You’ve got your play area, your slide area, your dancing area, your pool area, your bar area, your BBQ area, and of course your wedding area, because duh! What else would you add after all those other awesome things? One thing is definitely for sure, your Sims will not be bored living here! This is such a great community lot, with so much potential for a great day out for your Sims! There’s so much to love, from the awesome patio areas to the beautiful barbecue spot. And that’s without mentioning the slides! Definitely all the makings of an awesome afternoon of fun, or a great date spot! We feel like Bouclettif might have been reading our dream journal, because this lot is literally what our dreams are made of. 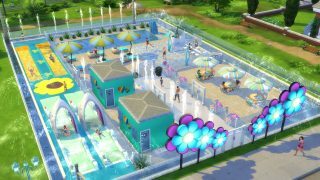 The color scheme is so bright and pretty, there’s a great dance area, a giant pool and… So. Many. Slides. Who wouldn’t immediately be won over by giant purple and blue spinning wind catchers? The only thing left to do now is to try and pick which one to place in your game! Let’s face it, you’re probably going to go ahead and just download all five like we did. Got any other Backyard Stuff lots that you totally love? Head over and tell us all about it on Twitter!